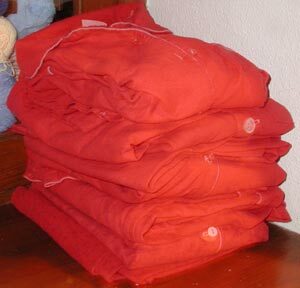 As part of my RIT kick, I took all my ratty old flannel pajams & dyed them red. So now instead of 4 dumpy faded floral pairs, I have 4 cute red ones! I did it in a long hot cycle in the machine, with 2 cold rinsesÂ & the results were as bright as my stove-dyed ones. But I did use the bottled stuff instead of the powder. I also learned that if you start my machine with liquid (in this case, a bottle of dye and a cup of salt dissolved in a couple gallons of hot water), it will drain out all the liquid before starting the cycle. Pushed start & heard it draining. The laundry’s in the basement, which means all drains empty intoÂ thisÂ hole in the foundation & then gets pumped up & out, so I ran into the boiler room & watched in horror as all my dye ran right back out. Luckily, I had a second bottle, so I ran upstairs & dumped just the dye & a cup of salt into the washer & hoped that wouldn’t rate heavy enough to drain. It didn’t, and it turns out pre-mixing wasn’t necessary. I do wish I’d bleached out the patterns a bit more first, as you can still see them a bit on 2 of them. I love red pajamas! They’re all old-timey. They always make me thing of a Popeye-faced hillbilly in long underwear standing on the front porch of his shack with a shot gun. I must’ve seen that in a cartoon somewhere. I think the hillbilly version is long underwear… flannel pajamas remind me of being a little kid, because now that I dress myself there is no way I’ll have the presence of mind to change my clothes before I fall asleep.